Governments around the world are passing laws requiring industry to assess the toxicity of the chemicals and products they produce, but to do so while reducing, refining, or even replacing testing on animals. To meet these requirements, experimental toxicologists and risk assessors are adopting quantitative approaches and computer simulations to study the biological fate and effects of chemicals and drugs. models for toxicant-target tissue interaction. models for cellular, organ, and organism responses. A website containing computer codes accompanies the book to help the reader reconstruct the models described and discussed in the various chapters. Quantitative Modeling in Toxicology serves as an essential reference source and tool box for risk assessors and researchers and students in toxicology, public health, pharmacology, and human toxicology interested in developing quantitative models for a better understanding of dose-response relationships. An expert in pharmacokinetics/toxicokinetics, toxicology of chemical mixtures, computational toxicology, and health risk assessment methods, Dr. Krishnan has been the leader of the risk assessment methodologies theme team of the Canadian Network of Toxicology Centers, member of the U.S. National Academy of Sciences' Sub-committee on Acute Exposure Guideline Levels, President of the Risk Assessment Specialty Section of the Society of Toxicology, and advisor for the International Programme on Chemical Safety (IPCS) of WHO. He is a member of the editorial boards of Toxicological Sciences, International Journal of Toxicology, Journal of Applied Toxicology and Journal of Child Health. Dr. Andersen is (1) the Director, Computational Biology Division, (2) Director, LRI-ACC Research Program and (3) Science Advisor, Center for Human Health Assessment at CIIT Centers for Health Research, Research Triangle Park, NC. Between 1971 and 1994, he held positions in toxicology research and research management in the federal government (DoD and US EPA) and in private industry (Chemical Industry Institute of Toxicology). He is recognized for developing short-courses and computer demonstrations in pharmacokinetic and pharmacodynamic modeling. He has received several awards for professional contributions, is a Fellow of the Academy of Toxicological Sciences and is recognized as a 'highly cited' scientist by the Institute for Scientific Information. 1 Quantitative Modeling in Toxicology: An Introduction (Melvin E. Andersen and Kannan Krishnan). SECTION 2 PHYSIOLOGICALLY-BASED TOXICOKINETIC AND PHARMACOKINETIC (PBPK) MODELING. 2 PBPK Modeling: A Primer (Kannan Krishnan, George D. Loizou, Martin Spendiff, John C. Lipscomb and Melvin E. Andersen). 3 Pharmacokinetic Modeling of Manganese – An Essential Element (Andy Nong, Michael D. Taylor, Miyoung Yoon, and Melvin E. Andersen). 4 Physiologically Based Modeling of Pharmacokinetic Interactions in Chemical Mixtures (Sami Haddad, Robert Tardif, Jonathan Boyd, and Kannan Krishnan). 5 Physiological Parameters and Databases for PBPK Modeling (Douglas O. Johns, Elizabeth Oesterling Owens, Chad M. Thompson, Babasaheb Sonawane, Dale Hattis and Kannan Krishnan). SECTION 3 MODELING TOXICANT-TARGET INTERACTIONS. 6 Modeling Cholinesterase Inhibition (Charles Timchalk, Paul M. Hinderliter, and Torka S. Poet). 7 Modeling of Protein Induction and Dose-Dependent Hepatic Sequestration (Andy Nong and Melvin E. Andersen). 8 Bistable Signaling Motifs and Cell Fate Decisions (Sudin Bhattacharya, Qiang Zhang, and Melvin E. Andersen). 9 Ultrasensitive Response Motifs in Biochemical Networks (Qiang Zhang, Sudin Bhattacharya, Courtney G. Woods, and Melvin E. Andersen). 10 Gene and Protein Expression – Modeling Nested Motifs in Cellular and Tissue Response Networks (Melvin E. Andersen, Qiang Zhang, and Sudin Bhattacharya). 11 Modeling Liver and Kidney Cytotoxicity (Kai H. Liao, Yei M. Tan, Harvey J. Clewell III, and Melvin E. Andersen). SECTION 4 MODELING TISSUE AND ORGANISM RESPONSES. 12 Computational Model for Iodide Economy and the HPT Axis in the Adult Rat (Jeffrey W. Fisher and Eva D. McLanahan). 13 Two-Stage Clonal Growth Modeling of Cancer (Rory B. Conolly and Melvin E. Andersen). 14 Statistical and Physiological Modeling of the Toxicity of Chemicals in Mixtures (Hisham A. El-Masri, Michael A. Lyons, and Raymond S.H. Yang). 15 (Q)SAR Models of Adverse Responses: Acute Systemic Toxicity (Mark T.D. Cronin, Yana K. Koleva, and Judith C. Madden). SECTION 5 MODEL APPLICATION AND EVALUATION. 16 Modeling Exposures to Chemicals From Multiple Sources and Routes (Panos G. Georgopoulos, Sastry S. Isukapalli, and Kannan Krishnan). 17 Probabilistic Reverse Dosimetry Modeling for Interpreting Biomonitoring Data (Yu-Mei Tan and Harvey J. Clewell III). 18 Quantitative Modeling in Noncancer Risk Assessment (Q. Jay Zhao, Lynne Haber, Melissa Kohrman-Vincent, Patricia Nance, and Michael Dourson). 19 Application of Physiologically Based Pharmacokinetic Modeling in Health Risk Assessment (Harvey J. Clewell III). 20 Uncertainty, Variability, and Sensitivity Analyses in Simulation Models (Sastry S. Isukapalli, Martin Spendiff, Panos G. Georgopoulos and Kannan Krishnan). 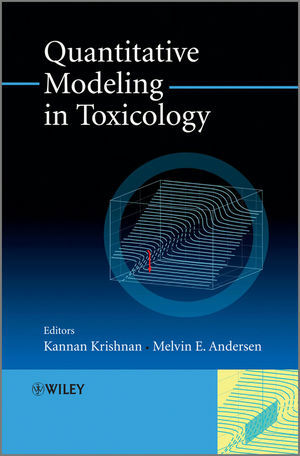 21 Evaluation of Quantitative Models in Toxicology: Progress and Challenges (Kannan Krishnan and Melvin E. Andersen).